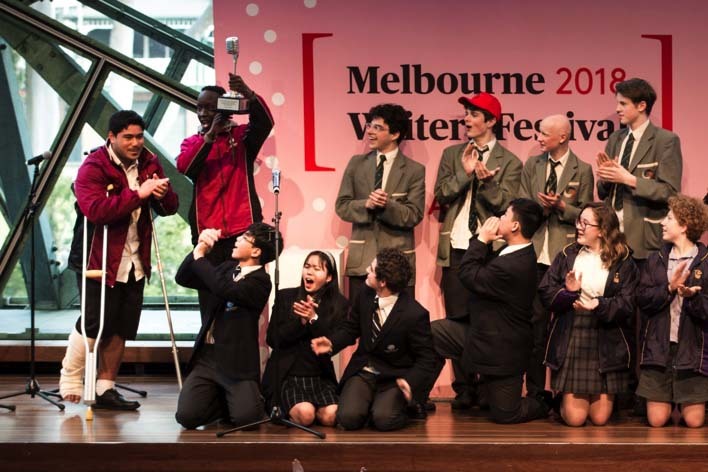 SEVEN SCHOOLS fought to claim the title of Victoria’s finest and fiercest spoken-wordsters as they battled it out at the grand final of OUTLOUD ECO!SLAM 2018, a high-school poetry slam competition, created by Australian Poetry in partnership with Red Room Poetry and Royal Botanic Gardens Victoria. Akegma Arok and Shalom Tiatia, a team of two from St Albans Secondary College, brought their fiercest and best performance to take out the title of OUTLOUD ECO!SLAM winners for 2018, speaking their own truths on equality. 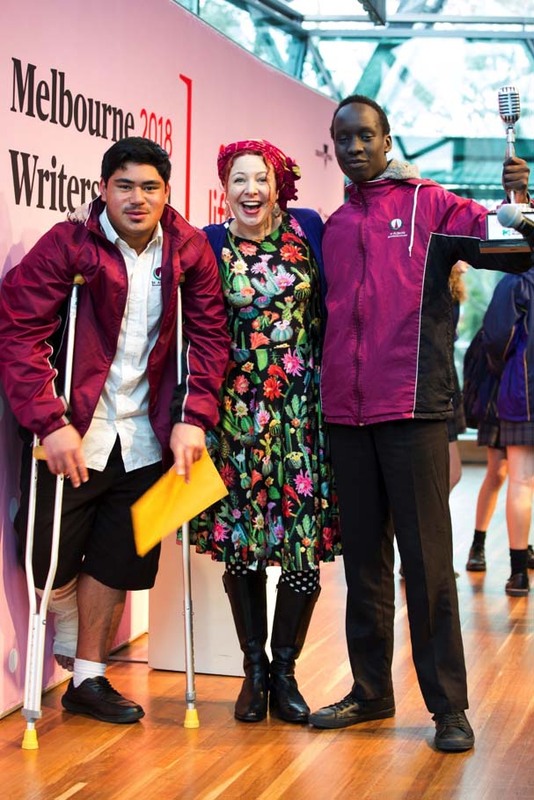 Judges included renowned YA writer Daniella Binks and spoken word poet Soreti Kadir. 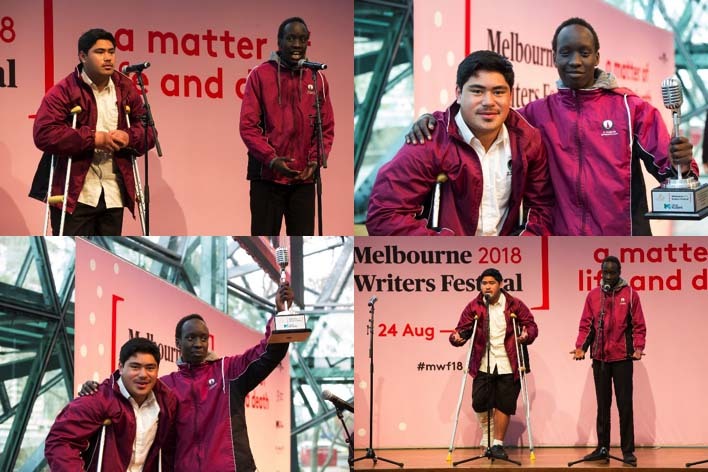 The sold-out Grand Final took place on Tuesday 28 August 2018 at Deakin Edge, Federation Square, as part of Melbourne Writers Festival 2018. The project, which will also run in 2019, is supported by the City of Melbourne Arts Grants Program 2018. Over six months, schools from all over Victoria developed, edited, rehearsed and polished original spoken word poetry performances. Nineteen schools competed in heats held at Melbourne Gardens, Royal Botanic Gardens Victoria. For the full list of schools, see below. Finalist schools were Haileybury City Campus, Geelong Sacred Heart, Northcote High School, John Monash Science School, Eltham College, Macleod P-12 College and St Albans Secondary College. 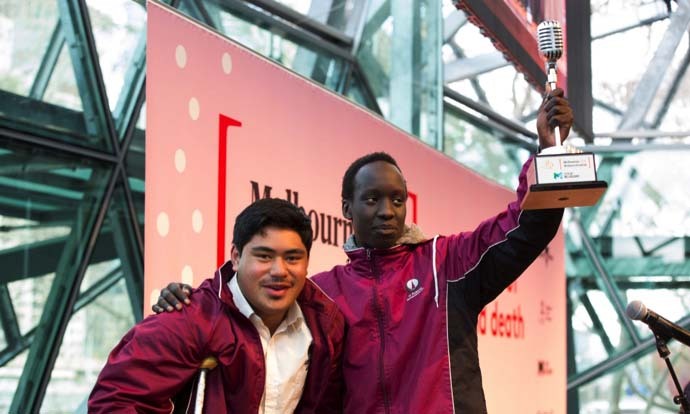 St Albans High School will receive a paid performance at the State finals of the National Australian Poetry Slam at the State Library of Victoria, a radio interview and a professional workshop with a leading internationally acclaimed hip hop artist and poet. Poems will be published on AP and RR websites, and in AP’s publications. Akegma and Shalom also receive individual subscriptions to Australian Poetry and Express Media magazines. At first when we were working on it, we weren’t really serious about it, but after winning at our school preliminaries, we started to take it more serious and became more determined and eager to actually try and win the Outloud Poetry Slam Comp. When they announced our names as the winners, i was dumbstruck. I was surprised at the fact that we took it out amongst many other talented students and schools, although at the same time, i felt as though we had a good chance of winning as i prayed and believed that God would make a way and prove that he can do all things if i believed, and that’s exactly what happened. Poetry in itself was a whole new world for me. As it is an art form of speech that requires you to be able to speak your mind and to express your views through Literature and the use of rhyme and rhythm. I am generally a very shy person and not really good with being in front of an audience, but doing poetry and going through the Outloud comp has made me feel more comfortable in front of audiences. Is it something that i’ll still do?, well doing poetry had never been part of my plan for the future, however, after winning, it is something that i will consider. But well see. Our final performance and those leading up towards the finals helped us anticipate what it would be like performing in front of a large crowd. Practices and performances were easily distinguished seeing, as performances demanded a high level of focus and concentration from both participants. In the end, the effort and enthusiastic aurora on that stage was felt and enabled the both of us to deliver our best presentation. Hearing our names being called and being titled “winners” was an unreal moment. It took me several moments to comprehend our newfound success but we were truly happy and thankful for the experience that Emilie Zoey Baker had provided for the both of us. It is amazing what a little opportunity can do. Poetry has always been a part of my life. The cultural, religious and social aspects of poetry have critically shifted my worldviews and the way I perceive global matters. The way in which words enable us to communicate, interpret and display emotion was what made me fall in love with writing poems as well as writing my own music. My poetic adventures have just begun and I hope to continue influencing others through my words and enabling them to find deeper meanings and purposes to their own lives and dreams. Akegma and Shalom speak their experiences from the heart. They are well-respected students within St Albans Secondary College and we’re all so happy for them to be able to pursue their dreams. And we’re thankful they were given the opportunity to shine through the OutLoud competition.